Well, I guess it started two years ago with a trail cam pic of a 9-point with a broken main beam on the right side and a small drop on the right beam. My friends and I looked at this buck and figured it was 2 1/2 years old and it was a shame it broke off the tip of its beam (about 4-6 inches). The season came and went and no one at camp saw the buck. Fast forward to October 2010, checking the cameras, an 11-point drop-tine showed up and didn't seem to mind the flash as I was getting multiple pictures at a large scrape. Every 3 to 4 days I would get a picture at this location... but all at night. I moved cameras down trails to see which direction he was coming from and was rewarded with more pictures of the buck, still all at night. By the first week of November I knew where the buck was staying, but didn't have permission to hunt that piece of property. I had several other good bucks on camera, including a wide 8-point that we'd seen several times, but too far away or in thick brush. Nothing worked to get the 8-point to come closer. He would run from any grunt or bleat, no matter how soft or loud it was given. My vacation was the during the first week of November with another week scheduled for December. My friend Joe F., whom I work and hunt with, told me I should move my December vacation so I'd be off for my birthday. "You always have good luck on your birthday and I can't believe your going to work. ", he said. Well, long story short, I moved my vacation on his insistance. November 12th was always good for deerhunting and being my birthday I had high hopes, but didn't see a shooter buck that day. I did, however, manage to roost a flock of gobblers that evening. The rest of the guys made it to camp that night and decided to take me out for a drink, or two, for my birthday. Saturday morning came too fast. I decided to go after the turkey I saw fly to roost the evening before with the youngest member at camp, my friends younger brother Mike. After answering questions by the other guys on where I thought they should try, we headed out. We got close to the birds, but no luck. Mike and I returned to camp by 8:30 am and killed some time playing some X-box. At 9 o'clock I got a text from his brother Joe who was sitting on the edge of a cornfield with a good look into a lower CRP (Conservation Reserve Program) field some 400 yards away. "Hey that wide 8-point you're after is dogging three doe in the CRP field and has been for about 40 minutes. Why don't you see if you can sneak into the stand on the edge of the field. If you bump him, I'm by the corn and my dad is in the 20 acre woods above them." I texted back that I would try that and quickly got dressed and headed out. After getting to the 30 acre piece wherre all this action was taking place, I knocked an arrow from my hip quiver ( I prefer a hip quiver as like to stalk and it reduces weight and noise on my bow ), and started down the roadway that would get me closest to the stand. I had made it maybe 100 yards, watching to my left into the CRP field, when a 4-point jumped out from the brush on my right. He stopped broadside about 20 yards from me. I wasn't interested in him and I froze as he walked right up the roadway where I was walking. At ten yards, he turned broadside again and entered the brush to my left. I continued my slow approach and went only another 40 yards when I noticed a deer standing behind a bush to my right... it was the Droptine!! He was only 15 yards away looking right at me!! I didn't have time to think and instantly drew my bow. The only part of him that was clear of the bush was his head and neck, no shot. 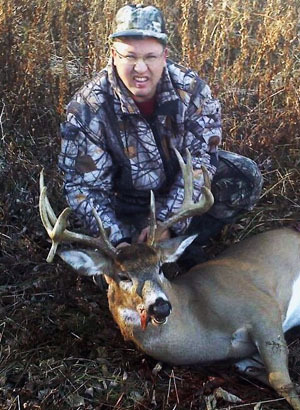 He didn't look like he was going to stay long, he really wanted to get to that CRP field. When he turned broadside, instead of heading back where he had come from he started toward the field, giving me a small opening between a fork in the bush. The arrow was gone before I knew I pressed the release. He jumped directly into the roadway I was standing on and the arrow flipped out and over his back landing five yards from me. He ran about 40 yards to my left and stopped to look at me. I took my eyes off him for a second to get another arrow from my quiver and onto the string, and when I looked back he was gone... or so i thought. I quickly called my friend Joe. I told him I just shot the droptine and not to get out of his stand overlooking the CRP field as I hate tracking thru 5 - 6 foott tall golden rod. I told him the buck ran into the woods where his father was hunting (his dad will use a radio, but no cell phone) and to get a hold of him on the radio. My next call was to my friend and co-worker who had taken the mornig off to spend with his family and only lived two miles down the road. I interupted his breakfast with, "I just shot the droptine and have to track it." I don't know how he understood what i said, but his response was, "Where are you?" I told him on the edge of the 30 acres... he said he was on his way... I think I heard his car door slam and saw a plume of dust above the trees as he left his driveway. As my phone rang back (Joe F. wanting to know where he should meet me ), I saw the goldenrod move where I last saw the buck. Then a bush moved, and I told Joe I thought the buck was right in front of me. A cloud of dust was visiable above the trees and the sound of tires sliding to a stop on gravel. Seconds later, my friend appeared. I pointed out where I saw the buck last and we decided to split up and approach from different angles. I headed where i saw the buck last, and him dropping below it in case it jumped up and headed toward the goldenrod. Did i mention how much i hate tracking in golden rod? Moments passed when I yelled, "I see him and he's dead!!!" I wasn't prepared for a running hug from Joe F. and a lot of jumping around and yelling occured. I guess we were loud enough to hear 600 or so yards away as Joe J. heard us and headed our way. He picked up his father along the way explaining what happened (as he was unable to reach him on his radio). After a lot of pictures, and calling a few friends that hunt , things calmed down and I decided to cape him out and butcher him, as it was a warm day. I found a 5 - 6 inch long stick protruding into his body cavity encased in a membrane between his 10th and 11th rib on his left side. I guess I'll never know for sure, but maybe that is what caused the droptine on his right beam. When I checked the cameras, I ended up with one daylight picture of him two days before. Other than that every other one was at night.